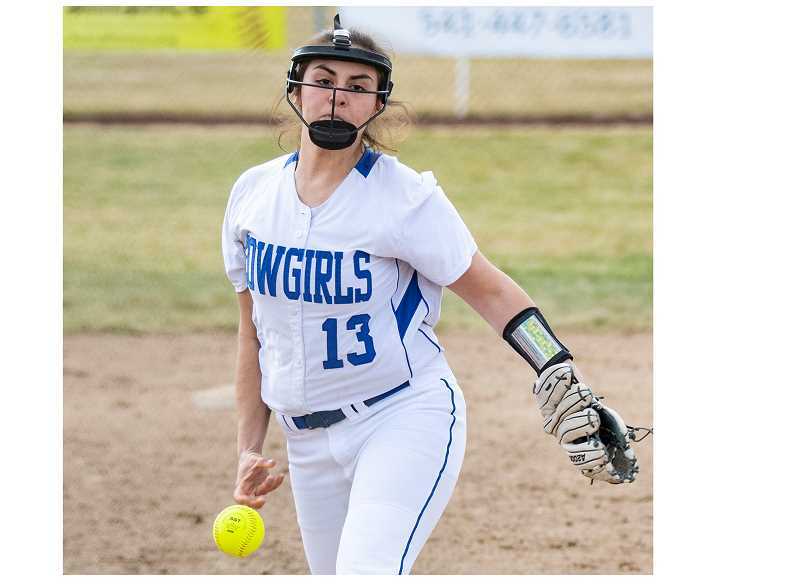 The Crook County Cowgirls rolled past Mountain View 14-1 Friday afternoon to take a non-league softball game against the Cougars in Bend. "Defensively, I thought we did real well," Crook County head coach Jeremy Puckett said. "Kalyn Martinez pitched the whole game and did a great job. Not a lot of action for our fielders and balls that were hit, but we made the plays, didn't have any errors and played well." The game brings to mind a scene in the movie "Hoosiers," where coach Norman Dale, played by Gene Hackman, benches his star player, Jimmy Chitwood, and finishes a game with just four players. Dale makes the decision to give up the game to make a point to the team. The team loses the game but goes on to be the only small school in history to win the Indiana All School State Basketball Championships. However, unlike in the movie, the Cowgirls started and finished the game with just eight players and were still able to win the game. "It was a decision that was made amongst our team captains," Puckett said. "They thought that was what was best for our team to learn from some things that we went through as far as eligibility and forgetting some gear. We as coaches brought them in and had a conversation, and they thought that it was important that we didn't bring up another player to fill in the gap and that we took ownership and said, 'This is the way that we are doing things.' In the long run it's a positive thing." As a result, the Cowgirls played the entire game with just two outfielders instead of the usual three. As it turns out, it didn't make any difference as the Cowgirls rolled to an easy win. Martinez gave up some walks, accounting for the lone Mountain View run, but also struck out nine and didn't allow a hit in her five innings of work. The no hitter was preserved in the fourth inning when Ashley Owens made an outstanding defensive play. "Ashley had a great catch," Puckett said. "She was playing right centerfield with only two outfielders, and she caught a diving fly ball, and the girls did not tag up on third base, and she threw it on a line and doubled up the girl at third base. That was a great play." Although the Cowgirls scored 14 runs in just five innings of play, they actually struggled to hit the ball for much of the game. Crook County finished with just five hits in the game. However, they were able to take advantage of walks, timely hits, and good decision making to make the most of their few hits. "We were struggling hitting early in the game," Puckett said. "Our timing was way off. Our hitters were way in front of it." In the third inning, the Cowgirls finally got their offense rolling, moving baserunners with bunts and taking advantage of Mountain View errors as they broke the game open. "We were bunting and moving baserunners and scoring a lot of our runs from small ball," Puckett said. "Then, in the second half of the game, we got more of our timing down and started hitting the ball really hard." There were two monster hits for the Cowgirls in the game. First, Berkley Puckett ripped a double off of the fence, then Liz Barker hit a towering home run blast over the left field wall. "Barker hit one over the fence with the wind that was blowing in at 25 miles an hour," Puckett said. "At Mountain View, their fence is like the green monster at Boston that is about 40 feet in the air, so the ball was hit really hard to get over the fence with the wind the way that it was." Barker was 2-4 in the game, while Allie Vaughan went 1-for-3 with a pair of RBIs. The Cowgirls did a great job of moving baserunners in the game, not only laying down perfect bunts, but also stealing six bases in the game. With the win, Crook County improves to 6-4 on the year, while Mountain View drops to 0-9. The Cowgirls are back in action today when they host Sisters in a 4:30 p.m. game. The team then starts the Intermountain Conference season on Saturday, with a doubleheader against No. 6 ranked Pendleton, which enters the game with a 7-3 record. Game one is scheduled to begin at noon with game two starting at approximately 2 p.m.